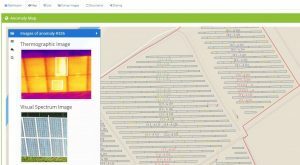 The value of aerial thermography and interactive reporting. A recent inspection at a 5MW solar farm identified 127 open circuit sub strings, possibly indicating activated diodes. Follow up work onsite to rectify these defects resulted in only 2 diodes being replaced, the other 125 defects were a result of loose connectors in the junction box. All the remedial was tracked and recorded on our SolarGain reporting portal. Another example of the value of regular aerial thermography and interactive reporting.